Tim Huey has been in private practice defending DUI clients since 1984 and limits his practice almost exclusively to the defense DUI of cases. The first Ohio lawyer to obtain both the DataMaster and Intoxilyzer breath testing devices, he has received advanced training on the theory and use of both instruments as well as training in the NHTSA SFST protocol. Mr. Huey is a life member of and past vice-president of the Ohio Association of Criminal Defense Lawyers (OACDL.) 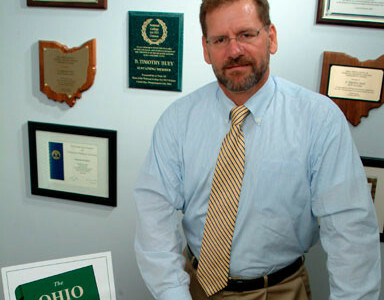 He is the Ohio delegate to the National College of DUI Defense (NCDD) and, in 2005, was named as a Sustaining Member. 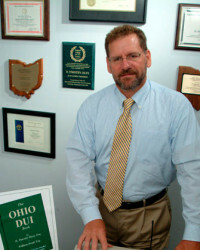 In addition to numerous DUI seminar presentations in Ohio he has given presentations in other states and been a lecturer, mock trial participant for the National College at the Masters of Scientific Evidence seminar and a break out session leader at the intensive 2007 NCDD Summer Session held at Harvard University. In 2003 Mr. Huey and NCDD Regent Bruce Kapsack of California were sponsored by former Regent Charles Sifers and approved to appear Pro Hoc Vice in Oklahoma to cross-examinations of the officers and state’s experts on the SFST / HGN procedures. This effort helped keep HGN evidence from being scientifically accepted in Oklahoma. Mr. Huey currently serves as co-chairman of the OACDL DUI Comm. and is responsible for the two day Advanced DUI defense seminar held each year in March.